Today was really just a day of going through the motions of life on Te Araroa. A day of waking up, shouldering my pack and walking through the mountains towards St Arnaud. There was nothing really speclatular to write about today. Just rocks, scree and lots of climbing up then back down. Continuing through similar terrain as yesterday I was starting to get sick of this portion. Sure it was great to be outdoors and not sitting behind a desk but there was little change in the trail and boring. From the start the trail was straight over the top of yet more jumbles of rock and boulders. With each foot step, feet were at irregular angles and it was difficult on the ankles. The trail passed over yet more scree, slately slopes, traversed whole hill sides of gravel and passed through the occasional swampy area. I reached Porters Hut in 2.5 hours (DOC time = 4 hours) and was glade I stayed at Hunters last night insetead of pushing on. Porters was not that welcoming, on the edge of a clearing with few views and not the best water source. Fom Porters the trail cut a path along the top of a really steep bank overlooking the Lowther Creek about 100m below. The footing was fine and it would have been difficult to fall but if you did fall I doubt you would stop until the bottom. Before long the trail wound steeply down to the river itself which had to be crossed. The wide river valley filed with boulders, rock and gravel. A myriad braids of water cutting their way through. I found a dry crossing by hopping from rock to rock over the blue crystal clear water. The trail then climbed up through a gravel creek bed towards a small saddle. Some scrambling through was required up steep banks of gravel, trying not to cause an avalanche under my feet. 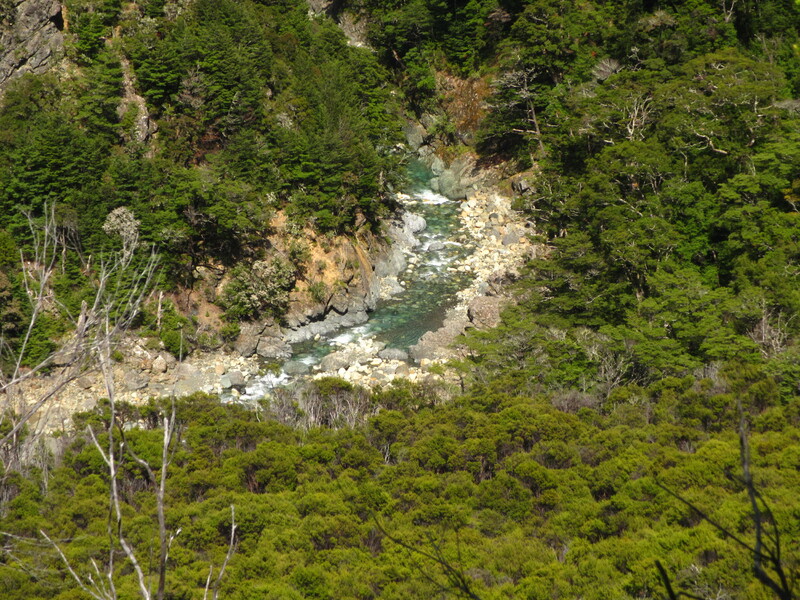 It was briefly back into the trees and away from the rock but all too shortly lived before leading back onto the rocky path and steeply down a thin ridge to the Motueka River. The trail traversed high above the river for much of the day, offering clear views right up the valley. I really liked the traverse trail. It was a sidle track but pleasant and made for fast walking. On reaching each smaller creek feeding into the main river the trail climbed down to cross before ascending again but the grades were fairly good. Each feeder creek was easily crossed while keeping shoes dry. After 3 km the Motueka itself had to be crossed. It was wide and fast flowing and I couldn’t find enough boulders for a dry feet crossing. On each side there were enough boulders to make it to the middle with dry feet but nothing in the main channel to bridge the gap. So it was shoes off for this one. I’d kept my feet dry all day and didn’t want to get them wet for one crossing. It wasn’t too bad. Flat rocks on the bottom made it easy on bare feet. Across the other side and with feet dried I had to climb around 200m above the river back to where the trail cuts a traverse across slope high above the river again. 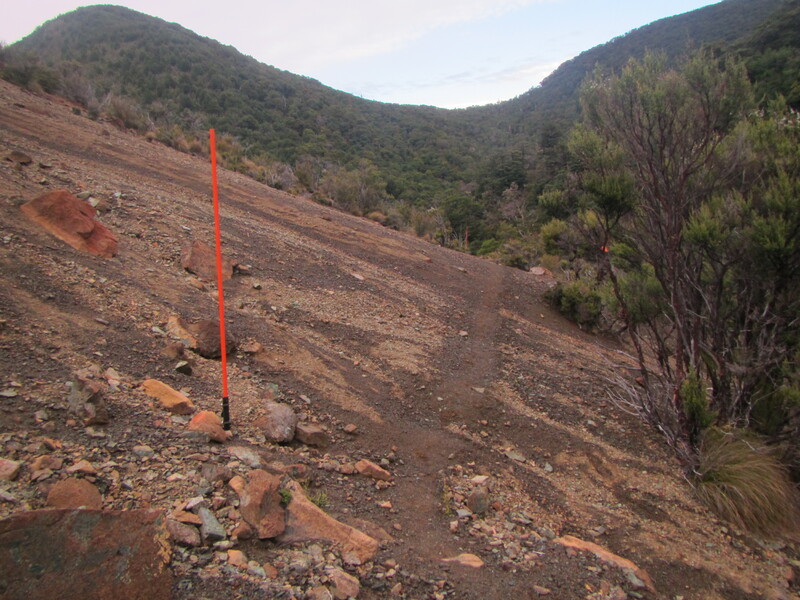 Climbing was slow in the baking sun and once on top it was 4.5km of traversing to Red Hills hut. The pace was quick again on this trail. Towards the very end near Red Hills Hut it passed through more areas of swampy ground and after keeping my feet dry the inevitable happened, a pool of black water hidden beneath tussocks caught my feet and saturated them – damn. I reached Red Hills just after 1:30p m and had a quick lunch but was keen to make it town still 16 km away and didn’t hang about long. Bashing down an old 4WD track for 6 km I reached State Hwy 63 in an hour. I thought about hitching the last 10 km into town but the road was twisty and turning with no where really for cars to pull off safety, particularly when they are at full speed on the main road. There wasnt much traffic anyway so rather than wait for a ride I hoofed it into town on foot, reaching St Arnaud at 5:30pm. Sounds like you’ve hit a wall going through the process for a while. You will recover your mojo and am sure will meet up with some of your friends again. Keep well, stay strong.